Why Mothers Car Wax remains as retail grade and not professional grade. Mothers Car Wax products remain popular choices among both car enthusiasts and driveway detailers alike. I started using Mothers California Gold cleaner wax as my very first car wax back in the early 80's. Not much has changed with this product at it seems to be one of the few products that goes unchanged year after year. While Mothers car wax reviews remain positive among the many detailing forums, one will start to notice it is not a product line used by any true professional detailer. My personal and professional conclusion is that it remains more of a retail product line rather than what many would consider true professional grade, or enthusiasts grade car care products. With that said, there is one car wax of Mother's that I have found to perform at what I consider a professional level. As a detailing professional, I know that there are car care products that will work for most people under the critical eye as a consumer, and then there are car care products that must meet the rigors of critical customers who can afford the best of anything. For this reason I will offer my professional recommendations when choosing among Mothers waxes, along with what I consider a higher level of performance considered enthusiast, or professional grade. The following list of Mothers car care products are my personal and professional choice when shopping from the Mothers wax products. All these Mothers wax products are a must have for any driveway detailer looking to maintain the value and beauty of their ride! Perfect clay bar kit for any driveway detailer. Contains everything needed for complete removal of all paint surface contaminates. A "must do" prior to any application of car polish or car wax. Will last you for years; despite what you have read elsewhere. An easy to use Mothers wax product. Use when visual results are at the top of your priority list. See cleaner wax below if you feel your paint is in need of additional help due to neglect. For anyone looking to wax less often, rather than more often. Synthetics offer the best in durability through polymer technology. Will not achieve the visual performance of the paste carnauba wax. Likely the best choice for most people due to neglect of your car paint. 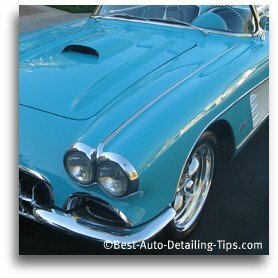 Will deliver the visual performance of traditional paste wax above, but with added chemical cleaners to remove additional "dirt" that diminishes the appearance of your car paint. Now you know which Mothers Wax products to use as the best car wax according to your priorities. It is possible to get the best of both worlds by applying the synthetic sealant first, then follow with an application of the carnauba wax; now you have the durability of a sealant, along with the visual perfection of a paste. I also recommend using the detailing spray that comes with the clay bar kit after your regular car washing's. This will create that just waxed look in minutes of time, as well as rejuvenate and extend your regular car wax applications. If you are looking for professional grade alternatives to any of the popular Mothers car care products, then you can follow this link to Best Car Waxes to see how I recommend alternatives from basic to premium grade car waxes. Past the foundational needs of car wax products, finding the best car wax will ultimately be a subjective call only you can make. My goal is to simplify the process for you based on professional recommendations, as well as finding an alternative to Mothers Car Wax if you are ready to take it to the next level of performance! Thank you for visiting! I bet you know of at least one other person who would benefit from the information I have taken so much time to produce, so please post this to your FB or Twitter account and help me spread the word! Or just send them the link and pay it forward in that manner. I have made it super easy to spread the word with my “Socialize It” button box at the very bottom of this page.